Few individuals in the history of baseball can boast of a career to rival that of Clark Griffith's. In terms of duration, as a player, manager, and executive, it was one of the longest ever, spanning nearly 70 years. Griffith is the only man in major league history to serve as player, manager, and owner for at least 20 years each. From his earliest days as a pitcher for money in Hoopeston, Illinois, to his last breath, the Old Fox, as he became fondly known, dedicated his life to baseball. A fiery competitor, he was outspoken, innovative, crafty and resourceful. He played with and against some of the pioneers of the game, was a star during its rowdiest era, managed for two decades, and was the face of baseball in the nation's capital for over 40 years. Along the way he won 237 games as a major league pitcher, helped to establish the American League, brought Washington its only World Series title, and could name eight U.S. presidents among his many friends. Clark Calvin Griffith was born on November 20, 1869 in Clear Creek, Missouri, to Isaiah and Sarah Anne (Wright) Griffith. The family, including Clark's four older siblings, moved from Illinois before he was born, intent upon farming in Oklahoma. They ended up settling in Missouri, staking out 40 acres near the settlement of Nevada, close to the Kansas border. Isaiah Griffith planned to farm the land, but the Clear Creek soil was not conducive to productive farming and he was forced to rely upon hunting to provide for his family. In February, 1872, when Clark was just two, his father was killed in a hunting accident, mistakenly shot by a neighbor youth. His mother, at the time of the accident expecting once more, struggled to raise six children in the rugged frontier. For several years she persevered, farming the land, while her eldest son Earl hunted for game to feed the family. Adding to their hardship, as he grew older, Clark became afflicted with a persistent ailment, eventually diagnosed, informally, as malarial fever. He was forced to bed for long periods, unable to assist with chores. Ultimately, the hard life, coupled with Clark's health problems, prompted the Griffiths move back to Illinois in 1882, where they found a home in the town of Normal, near Bloomington. Clark was about 12 at the time. During his early years in Missouri, he was introduced to baseball, made popular there by soldiers returning from the Civil War. Too small and sickly to play for the local teams, Clark nonetheless developed a love for the game and acted as mascot and water boy for his hometown club. Upon moving to Illinois, he found a more sophisticated version of baseball played there and, although still considered too small to play for his high school club in Normal, he played wherever possible in pickup games, earning a reputation first as a catcher and then as a pitcher. At 17, he was offered ten dollars to pitch for the Hoopeston, Illinois club against hated rival Danville. Clark took the money and won the game and by the end of 1887, he had entered organized ball, pitching for the Bloomington Reds. He became that club's star pitcher in 1888 when it joined the Central Inter-State League. At this time, he was also enrolled at Illinois Wesleyan University, but never completed his studies there. In July, Bloomington played an exhibition game against Milwaukee, a Western Association team, and Clark so impressed Milwaukee manager, James Hart (later owner of the Chicago Cubs), that he was offered a contract for $225 a month. Griffith starred for Milwaukee during the next three seasons until he caught the eye of Charlie Comiskey. Comiskey convinced him to jump to the American Association in 1891, where he pitched well, going 11-8 for the St. Louis Browns, but was released in mid-July when he developed a sore arm. He caught on with the Boston club near season's end, but when the Association disbanded, Clark was again looking for work. He toiled successfully the next two years in places like Tacoma, Washington; Missoula, Montana; and Oakland, but the leagues, like many in that era, were unstable, and the paychecks uncertain. With Oakland in 1893, Clark won 30 games, while also performing in Wild West skits on stage in San Francisco's Barbary Coast neighborhood after the league disbanded in August. By early September, though, he was signed by Cap Anson's Chicago National League club. There he found lasting fame as a pitcher, made numerous friends, and learned about showmanship and gamesmanship from the legendary Anson. Over the next eight seasons, Griffith won 152 games, six consecutive times winning over 20, and became a star. Never a power pitcher, Clark relied on wiles and control to get batters out, utilizing a variety of breaking balls, trick pitches, and deceptive deliveries to befuddle his opponents. A master of the quick pitch, he would toss a strike over the plate before the batter was set. He claimed to have invented the screwball while pitching on the West Coast in the early 1890s, and often experimented with the effects of friction on a pitched ball. One of his favorite tricks was to openly deface a new ball by gouging it on his spikes. Though the umpires often did nothing to discourage this, the Detroit club, after one particularly destructive game, presented Griff with a bill for eleven new baseballs. After his playing days were over, he claimed to have never thrown a spitball during his career, but it is difficult to believe he would have ignored any opportunity to gain advantage over a batter. "He was the first real master of slow ball pitching, of control reduced to a science, of using his head to outwit batters," said long-time New York sportswriter William B. Hanna. Chicago teammate Jimmy Callahan opined, "I will hand it unreservedly to [Christy] Mathewson as one of the greatest pitchers who ever lived. But I think that old Clark Griffith, in his prime, was cagier, a more crafty, if not a more brainy, proposition." Besides becoming a star pitcher, Clark also learned a thing or two about the business and politics of baseball and developed into a leader. He was the main catalyst in the April 1900 formation of the Ball Players Protective Association, an organization that didn't accomplish much in the area of players' rights, but one that played an important part in the successful launching of the American League. Near the end of the 1900 season, in which he won only 14 games, Clark met with Ban Johnson and his old friend Comiskey to discuss the possibility of Johnson's American League challenging the National League as a new major league. Comiskey and Johnson were clearly supportive of the notion, but feared, due to a lack of players, that it would be unsuccessful. Griff assured them he could get the players and advised them to wait until the owners meeting in December to do anything. When the National League turned down an Association petition for better pay, he had the ammunition he needed to recruit players for the new league. Immediately going to work, he single-handedly convinced many NL stars to sign AL contracts. Of 40 players targeted by the American League to form the foundation of its rosters, Clark claimed to have signed all but one: Honus Wagner. Comiskey, in turn, signed Clark to manage his Chicago White Sox. As White Sox manager, and the franchise's star pitcher, he won 24 games and led the club to its first major league pennant in 1901. The following year, he won 15 as the team slipped to fourth place, but the new league was a success. Following the 1902 season Johnson moved the Baltimore franchise to New York, and named the Old Fox as manager of the newly-christened Highlanders. Hope was fervent that Griff could bring a pennant to Gotham, but the Highlanders finished a disappointing fourth in their inaugural season. Clark won 14 games in what would be his last season of full-time pitching and, although he would log around 100 innings pitched in each of the next two seasons, his appearances increasingly were in the role of reliever. In 1904, mainly through the machinations of Ban Johnson, New York was fortified by the additions of Jack Powell and John Anderson, and the pick-up of Smiling Al Orth in July helped to solidify the team in its run for the pennant. On the season's final day, however, a wild pitch by Jack Chesbro denied the Highlanders a championship. It was the closest Griff would come to a flag in New York. The club was up and down in the standings over the next several seasons, sagging to sixth place in 1905, finishing second in 1906 and falling back again to fifth in 1907. In June 1908, as the team was beset with injuries and spiraling downward, losing 12 of 13 games, Clark announced his resignation. He blamed bad luck which followed the club, intimating that perhaps it was he, himself, who was the hoodoo. A disheartened Griffith stated, "It [is] simply useless for me to continue...I have tried everything, but it [is] fighting against fate." Over the next few months Griff was deluged by offers to manage other clubs. He made no secret of his desire to assume an ownership role, even in the minor leagues, and for several months he carefully considered all of his options. Finally, in December, in something of a surprise move, he signed a contract to manage the Cincinnati Reds and was back in the National League. Under Griffith, Cincinnati finished fourth in 1909, just nosing into the first division, distantly behind perennial leaders Pittsburgh, Chicago and New York. After three straight losing seasons, the campaign had to be considered a success, but it would mark the high point of Clark's brief stay in the Queen City, as the Reds dropped a notch in the standings each of the next two years. Although managerial success eluded him, Clark managed the NL's first Cuban ball players, Armando Marsáns and Rafael Almeida. He still longed to be an owner, however, and when the opportunity arose in 1911, he was ready to do whatever was necessary to avail himself of it. In September 1911, Washington manager Jimmy McAleer made a deal to become president of the Boston Red Sox, leaving a vacancy in the capital. Griffith's interest in the Senators job was enormous for several reasons: he wanted to be an owner, he enjoyed managing, and he wanted to return to the American League. It was a natural fit, even if it meant going to a franchise that had never had a winning season and never finished higher than sixth. All he had to do was come up with the money. Turned down for loans by his old American League friends, Ban Johnson and Charlie Comiskey, Clark risked everything by mortgaging the Montana ranch he owned with his brother to raise the necessary funds. He purchased a one-tenth interest in the Washington club, becoming its largest stockholder, and signed a contract in October 1911 to manage the Senators in 1912. One of the things the other Washington owners wanted from their new manager was someone who could develop new talent, thereby ensuring future success, instead of trying to make a winner out of the current roster of veterans. Clark was equal to the task, immediately releasing or trading several older players, and headed into spring training with few certainties. The Senators were unanimously slated for the second division by preseason prognosticators and did nothing in the early going to dispel those predictions. But in early June, after the pickup of first baseman Chick Gandil from Montreal, the club caught fire and reeled off 17 straight wins, all on the road. Walter Johnson began a personal string of 16 consecutive victories on his way to a new career high of 33, and the Nats vaulted into the first division. They remained there for the rest of the season, never seriously challenging for the flag, but arousing Washington fandom nonetheless, and their second place finish was by far the best performance in franchise history. Hopes were high the following season, but despite a Herculean effort (36-7) from Johnson, the club spent much of the first half in a double digit deficit behind Connie Mack's Athletics. A good second half salvaged another second place finish, with 90 wins, but that was as high as a Griffith-led team would finish during the remainder of his managerial career. The Senators slipped to third in 1914 and would finish no higher than that for the next ten years. With the onset of war against Germany in April 1917, Griffith launched an imaginative plan to involve the nation in supporting troops overseas. His idea was to raise money to purchase enough athletic equipment, mainly baseball gear, to outfit every U.S. military training camp. The idea caught on quickly and was an enormous success. Ballparks around the country, major and minor league alike, held Griffith Days and collected money for the effort. President Wilson contributed his two bits and donations poured in from every state. By July over $7,500 had been raised and the first shipment of equipment sailed for France. On July 11, however, the steamship Kansas, carrying outfits for 150 teams with General John J. Pershing's army, was torpedoed by a German U-boat and sunk in the Atlantic. Everything was lost. Undeterred, the Old Fox mounted another campaign almost immediately. In addition to equipment, Griff also bought mass quantities of the Sporting News and sent them to France to keep the troops updated on the pennant races. Ironically enough, as a former ball-scuffing pitcher, one of Clark's other contributions to the game during this period was leading the charge to abolish "freak" pitches, including the spitball and the shine ball, which helped eventually to bring an end to the Deadball Era. Although he penned essays against the spitter, the shine ball in particular, prompted a personal crusade by Griff, who claimed as early as 1917 that it was unfair and should be outlawed. Griffith continued to manage the Washington club through 1920. In December, 1919, he partnered with a Philadelphia grain broker, William M. Richardson, to purchase approximately 80 percent of the team's stock, again mortgaging the family ranch to borrow his half of the required $400,000. With the move, he became free to make whatever changes he felt necessary to strengthen the club. There was talk for a while of running the club for a few more years from the bench, as well as from the front office, but he lasted only one season in the dual capacities before ending his managing career. 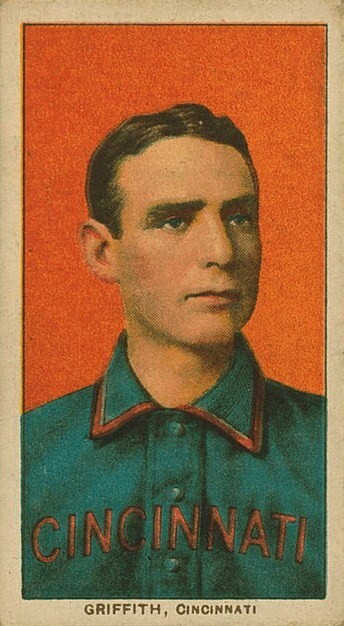 During his twenty years as a manager, Clark was credited with inventing the squeeze play and with leading the revolution toward more frequent use of relief pitchers. A vocal leader, it was estimated he was thrown out of more games than anyone in the era outside of John McGraw. Within four years, despite hiring four different managers, Griffith molded a club which brought the first and only World Series title to the nation's capital in 1924. Proving that it was no fluke, the Senators won the A.L. crown again in 1925, finishing 8-1/2 games ahead of Connie Mack's Athletics. The club lost a tough World Series to the Pittsburgh Pirates, who became the first team to rally from a 3-1 deficit to win a seven-game Series. Washington would win only one other pennant, in 1933, over the next thirty years. During his years as owner of the Senators, and as he grew older, Clark was perceived by turns as a shrewd judge of talent, a frugal and resourceful owner, a sentimentalist, a curmudgeon, a horse trader, a silent and generous benefactor, and a stubborn, outspoken voice against change unless it was on his own terms. He is often remembered for trading his niece's husband, Joe Cronin, to the Red Sox in 1934 for Lyn Lary plus a record price, and for selling his nephew, Sherry Robertson, to the A's for $10,000 in 1952. Both deals, however, had underlying reasons other than the bottom line and were made, ultimately, because Clark knew they would benefit the players involved. Griffith also a became a pioneer in signing Cuban players, whom he valued both for their skills and the fact that they could be acquired cheaply by his confidante in Havana, scout Joe Cambria. In Griffith's 44 years at Washington's helm, 63 Cubans reached the major leagues -- 35 of them with the Senators. As he passed his 80th birthday, Clark's age began to catch up with him. In December, 1950, after celebrating his 50th wedding anniversary, he underwent surgery for a hernia. Clark had married the former Anne Robertson in December, 1900, on the eve of his becoming manager of the White Sox. Although they had no children together, after Anne's brother Jimmy died in 1922, the Griffiths soon were soon taking care of (though never officially adopting) the seven Robertson children. Over the years all of them were employed in some capacity by the Washington ball club, most notably Calvin, took over the club's day-to-day operations in the early 1950s and became team president upon Clark's death. On October 19, 1955, Clark was admitted to Georgetown Hospital in Washington, D.C. for treatment of neuritis. He died of lung congestion on October 27, less than a month before his 86th birthday. His old friend and contemporary, Connie Mack, convalescing at age 92 after a hip fracture, was not told of Griffith's passing, but President Dwight Eisenhower, speaking for his family and the nation said, "Clark was a good friend of ours and we shall personally miss him greatly." Griffith was buried at Fort Lincoln Cemetery in Brentwood, Maryland, just outside of Washington, D.C.
Washington Post. 7/11/1900, 5/25/1902, 12/09/1918, 4/22/1917, 12/19/1919, 10/29/1955, 10/28/1955.